Try as I might, I can’t think of any comedies about teachers that did really well at the box office. Truthfully, I can’t think of many entries in this genre period, as school-based films tend to focus either on students or on “inspirational” instructors. So comedies that delve into the world of educators remain fairly rare, perhaps because they don’t seem to generate much box office heat. 2011’s Bad Teacher made a profit but as a film that barely cracked the $100 million mark, it didn’t exactly turn into a smash. Still, that beats 2017’s Fist Fight. Even with a low $20 million budget, the movie lost money, as it grabbed a blah $32 million US. That sum probably doesn’t encourage studios to churn out more teacher-based comedies. As someone who’s spent his entire career in education, the topic entices me, so I gave Fight a look. On the last day of school, high school Englishteacher Andy Campbell (Charlie Day) deals with a slew of pranks and shenanigans. In the midst of the semi-mayhem, Andy unintentionally upsets history instructor Rod Strickland (Ice Cube). A tough, tenured teacher who tends to intimidate the rest of the school, Rod challenges Andy to an afterschool battle. We follow the day and its repercussions. Viewers as old as I am will recall 1987’s Three O’Clock High, a movie that told of a confrontation between a nerdy kid and a school bully. Can I say for a fact that this film inspired Fist Fight? No, but the two sure offer strong thematic similarities. I never thought High offered anything special, but it looks like a classic compared to the abysmal Fist Fight, a movie so inept that it can’t even get its title right. Why isn’t it called Teacher Fight? Characters use that phrase repeatedly and it seems a lot more descriptive than the generic Fist Fight. Maybe the studio worried Teacher Fight would inspire negative publicity, but if so, why make the movie at all? A thoroughly nasty, mean-spirited effort, Fist Fight comes with nearly zero positives. Actually, it boasts a pretty good cast, but it wastes each and every one of the actors, and Day seems like a bad pick to play the lead. While funny in small doses, Day’s shrill, squeaky-voiced routine gets tiresome across 90 minutes. Not that the material would succeed in the hands of anyone else, as Fight comes packed with nothing more than cheap, crude stabs at humor. Virtually no cleverness materializes, as the film prefers lowest-common-denominator bits without any real humor involved. To make matters worse, Fight repeatedly stretches credulity in its quest for laughs. We get one scene after another that bears no connection to the real world, as the movie tosses any form of logic out the window. I get that Fight doesn’t pretend to be something realistic, as it just wants to give us a wild, wacky broad comedy. Even so, it needs some grounding in the real world and a form of internal consistency, neither of which arise. Instead, we just get a slew of terrible gags, each one dumber than the last. This leads us inexorably toward the resolution of various plot points that wrap up in a neat, tidy way with no real logic to support them. This really becomes an exceptionally flimsy framework for a movie, and Fist Fight stretches itself awfully thin. Even with a short running time, the movie becomes tedious well before it ends, and it gives us little more than a collection of bad set pieces cobbled into an unsatisfying whole. Footnote: in addition to bloopers during the credits, a bonus sequence shows up after these conclude. Fist Fight appears in an aspect ratio of approximately 1.85:1 on this Blu-ray Disc. This became a strong transfer. Sharpness looked very good. No obvious softness materialized, which meant a tight, well-defined image. I witnessed no shimmering or jaggies, and edge haloes remained absent. As expected, the film lacked any print flaws. In terms of palette, Fight went with a pretty standard mix of orange and teal. The film didn’t overwhelm us with those choices and made them semi-desaturated, but they still dominated. Within the stylistic decisions, the hues seemed fine. Blacks were deep and tight, and shadows looked smooth and clear. This turned into an appealing image. As for the film’s DTS-HD MA 5.1 soundtrack, it opted for a fairly standard “comedy mix”. This meant the soundscape accentuated music and general atmosphere and not much else. Exaggerated action moments opened up matters, and those bits added some life. Music filled all the channels but effects didn’t add a ton. Audio quality appeared good. Speech seemed distinctive and concise, without roughness or brittleness. Music was warm and full, and effects came across as accurate. Effects showed nice delineation and accuracy. This ended up as a satisfactory mix for a comedy. 11 Deleted Scenes run a total of 15 minutes, 23 seconds. Most of these offer additional bits from supporting characters, with more attempts at comedy on display. None of them offer anything meaningful or amusing. A promo for the Georgia Film Commission lasts two minutes, eight seconds and features director Richie Keen, executive producer Marty P. Ewing, production designer Dean Cornwell and producers John Rickard and Dan Cohen. We hear how amazing it was to shoot in Georgia. Yawn. A second disc offers a DVD copy of Fist Fight. It includes the same extras as the Blu-ray. Despite a talented cast, Fist Fight struggles to produce more than a handful of minor laughs. It offers a premise that it can’t back up with a coherent story and quality humor. The Blu-ray offers excellent visuals, acceptable audio and a few bonus materials. 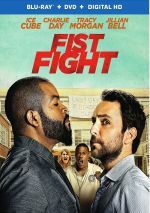 Fist Fight comes with promise that it fails to fulfill.